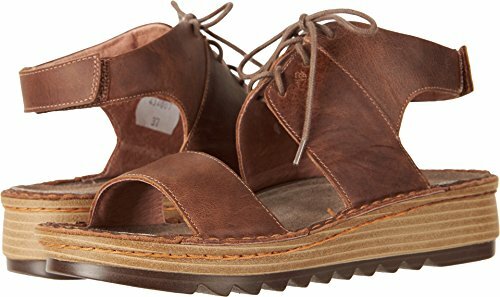 The Naot Fate is a stylish slide wedge. This style provides the look of a dressier style. Naot's anatomic cork and latex footbed is wrapped in pampering suede and molds to the shape of the foot with wear. The Supreme Collection features a metal shank and provides the look of a 2.25" heel without the feel. Heel hight: 2.25". Material: Leather, Polyurethane, Cork, Latex, Metal, Suede. 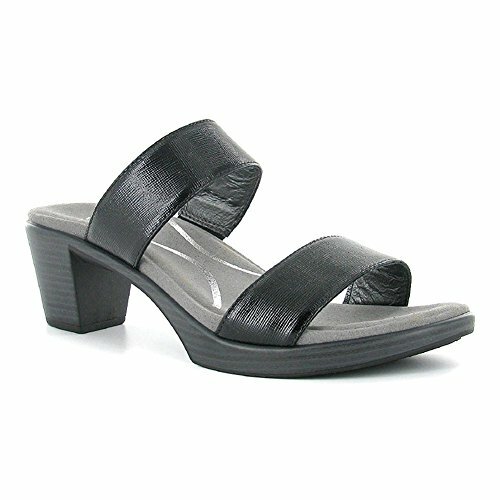 The Intact is a fashionable heel that features double hook and loop straps for complete adjustability. The Intact provides a dressier look. Naot's anatomic cork and latex footbed is wrapped in pampering suede and molds to the shape of the foot with wear. The Supreme Collection features a metal shank and provides the look of a 2 1/4'' heel without the feel. Material: Leather, Suede, Cork, Latex, Man Made. The Peyton is a slide sandal that is offered in an array of colorful hues. This style has gore at the instep for adjustability & a padded front strap for added comfort. Naot's anatomic cork & latex footbed is wrapped in a pampering suede and molds to the shape of the foot with wear. 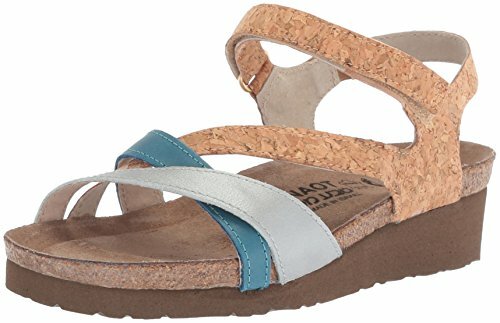 The Alpicola sandal is great for every day wear with a padded hook and loop backstrap and padded front. Laces allow for adjustability. Naot's removable, anatomic cork and latex footbed is wrapped in pampering suede and molds to the shape of the foot with wear. The Bloom Collection features a 1.75'' polyurethane sole which is extremely lightweight, and durable. Details: Bloom footbed, medium width. Material: Leather, Thermoplastic Rubber. 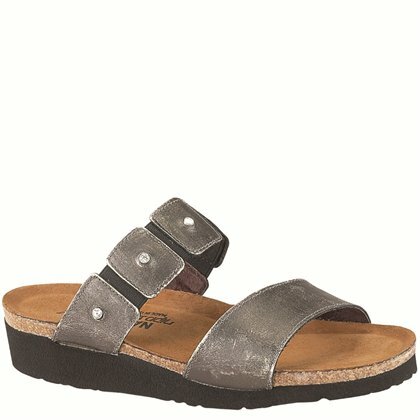 The trovador is a trendy gladiator inspired sandal with metal ornamentation. 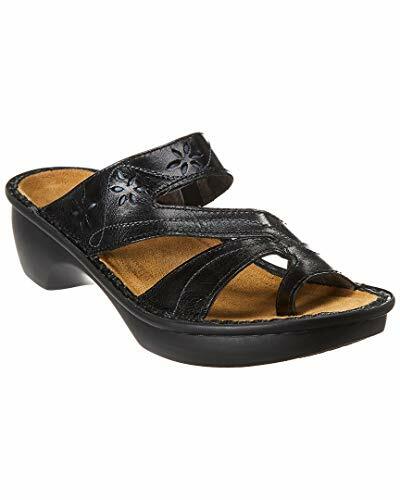 This sandal has a hook and loop closure at the ankle and a padded heel cup for extra support. Naot's removable anatomic cork and latex footbed is wrapped in pampering suede and molds to the shape of the foot with wear. The allegro collection features a 1.5" polyurethane sole which is extremely lightweight and durable. 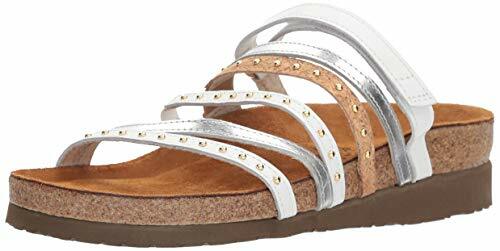 The naot Malibu is a feminine slide sandal with a rhinestone ornament up the t-strap. 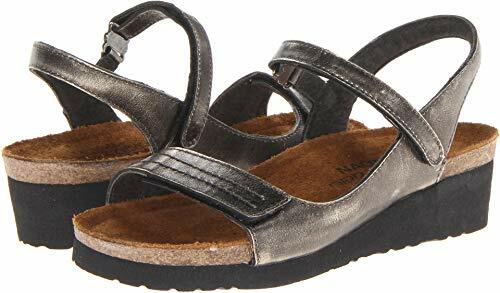 This style features a faux buckle hook and loop strap at the instep. Naot's anatomic cork and latex footbed is wrapped in a pampering suede and molds to the shape of the foot with wear. The classic collection features a 1.25" ethylene vinyl acetate sole. 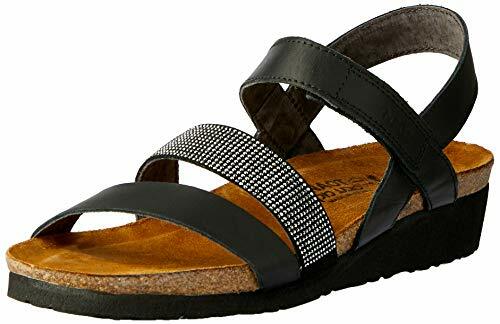 The Naot Sophia is a sandal with contrasting crisscross leather straps. This style has a hook and loop strap at the instep for adjustability and a back strap with gore for stability. Naot anatomic cork and latex foot bed is wrapped in a pampering suede and molds to the shape of the foot with wear. 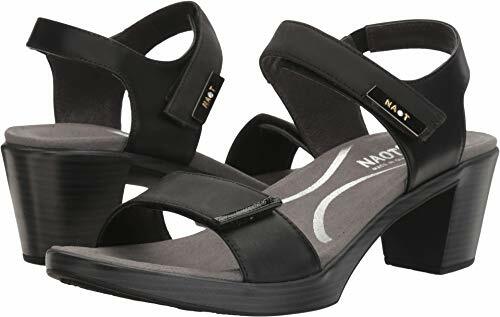 The naot Rachel is a feminine sandal with a hook and loop strap at the instep and a backstrap for added stability and support. The Rachel has a unique floral inspired design at the front. Naot's anatomic cork and latex footbed is wrapped in a pampering suede and molds to the shape of the foot with wear. 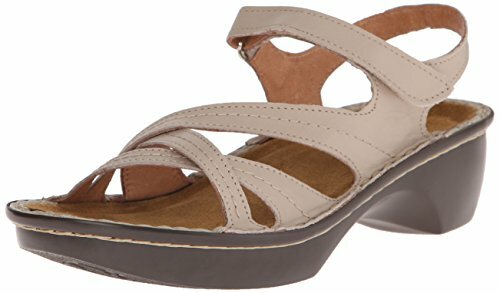 The paris is an great everyday sandal with a backstrap for extra stability and support. 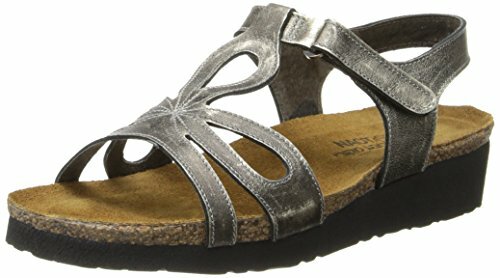 This sandal has a hook and loop closure at the instep for adjustability and a unique criss-cross strap front to help hold the foot in place. Naot's removable anatomic cork and latex footbed is wrapped in pampering suede and molds to the foot with wear. The cosmopolitan collection features a 2" polyurethane sole with a metal shank and is extremely lightweight and durable. 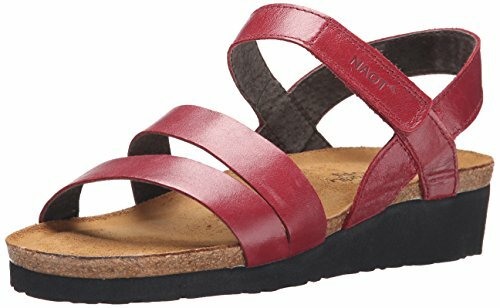 The naot Ipanema is a great basic slide sandal with a functioning stretch upper. Naot's anatomic cork and latex footbed is wrapped in a pampering suede and molds to the shape of the foot with wear. 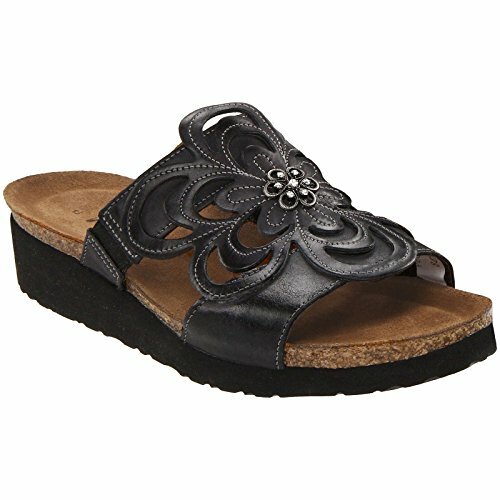 The naot sandy is a feminine slide with a flower inspired leather design and rhinestone ornament. This sandal has gore at both sides of the instep for adjustability. Naot's anatomic cork and latex footbed is wrapped in a pampering suede and molds to the shape of the foot with wear. 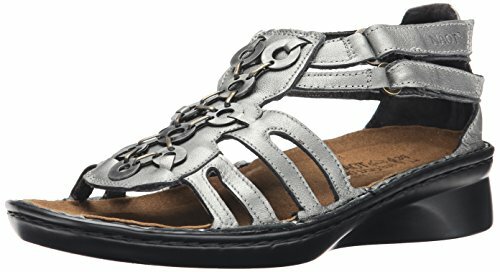 The Monterey is slide sandal with a unique z-strap design. 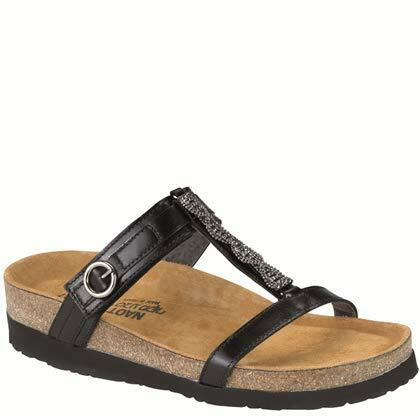 This sandal has a padded instep with gore and a toe loop for additional support. Naot's removable anatomic cork and latex footbed is wrapped in pampering suede and molds to the shape of the foot with wear. The high Scandinavian collection features a 1.75"" polyurethane sole which is extremely lightweight, stable and durable. 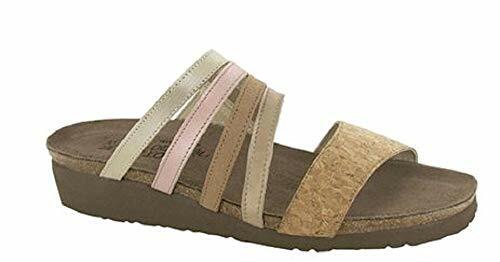 The Naot Madison is a great everyday sandal with a subtle stitch design. This style has two hook and loop straps for complete adjustability and a padded back strap for stability. The Madison has a side panel for extra support and a padded front strap for comfort. Naot's anatomic cork and latex footbed is wrapped in a pampering suede and molds to the shape of the foot with wear. For More Information or to Buy: http://qvc.co/1O8fFJZ This previously recorded video may not represent current pricing and availability. For More Information or to Buy: http://qvc.co/2r7Jsw2 This previously recorded video may not represent current pricing and availability. 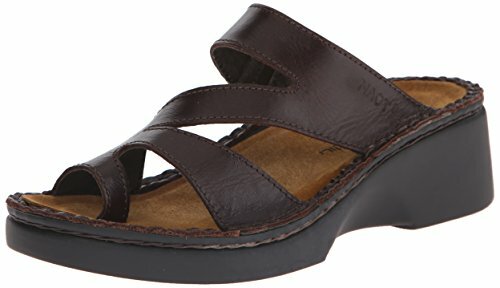 Compare prices on Naot Cork Sandals at Elevelist.com – use promo codes and coupons for best offers and deals. We work hard to get you amazing deals and collect all avail hot offers online and represent it in one place for the customers. Now our visitors can leverage benefits of big brands and heavy discounts available for that day and for famous brands.